Under Australian law, militia forces could be used only within Australian territory. Forces sent to fight elsewhere on behalf of the British Empire consisted of volunteers, and when fully trained, they were among the best infantry of the Second World War. 1 Australian Imperial Force fought in the First World War in Europe. 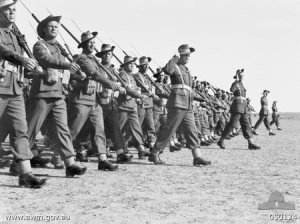 The volunteer force assembled for Imperial service in the Second World War was designed as 2 Australian Imperial Force. The following table lists only those formations in the Pacific Theater when war broke out in the Pacific. There were, in addition, three other divisions (6, 7, and 9) already deployed to the Middle East. All would eventually be recalled to Australia to fight against the Japanese. 8 Division (Bennett; at Johore) Training for the Middle East, but diverted (less 23 Brigade) to Malaya when war appeared imminent. Gull Force 1700 men; built around 21 Battalion. Preparing to deploy to Ambon. Lark Force (at Rabaul) 1390 men; built around 22 Battalion. Sparrow Force 1700 men; built around 40 Battalion. Preparing to deploy to Kupang. A training cadre preparing for deployment to the Middle East, where it would receive its tanks.